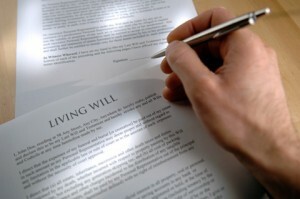 Imagine completing one living will document that conveys all of your personal, emotional, spiritual and medical wishes. An inexpensive document called Five Wishes has changed the way families plan for the end of life decisions. Wish 1- The Person I Want To Make Health Care Decisions For Me When I Can’t Make Them For Myself. Wish 2- My Wish For The Kind Of Medical Treatment I Want Or Don’t Want. Wish 3- My Wish For How Comfortable I Want To Be. Wish 4- My Wish For How I Want People To Treat Me. Wish 5- My Wish For What I Want My Loved Ones To Know. Five Wishes is available in 26 languages including Braille and it has been featured on CNN and the NBC’s Today Show. It is considered a legal living will document in 42 states. If your state is legally exempt, the information you complete can still be attached to your state’s form. Five Wishes resources can be purchased for $5.00 from http://www.agingwithdignity.org. If you don’t want to wait for the mail, there is an online option for completion. Five Wishes is an excellent tool for starting the sensitive conversations of end of life issues. A living will with Five Wishes is the best gift you can give to your loved one. Thank you so much for your kind words about our Five Wishes. There are more than 18 million copies in national circulation, and it is used all over the country and world to help those age 18 and older plan ahead of a serious illness. Individual copies of Five Wishes are $5 each, but only $1 each in quantities of 25 or more. We hear so many stories from people whose families have benefited from Five Wishes. Good luck with your terrific website and blog! — Paul Malley, President, Aging with Dignity, a national non-profit organization. I been married for over 35 years and I think this is a great tool for us to use. Thanks for providing this information.